Experts at HairStop and Shop believe the wig industry as a whole draws inspiration from female celebrities all the time. However, one star in particular seems to outshine them all and wig manufacturers compete to replicate Nicki Minaj hair styles. HairStopandShop.com, a popular online retailer of human and synthetic hair wigs, reports a surge in demand for Nicki Minaj inspired wigs. During the last two years of online retailing, Hair Stop and Shop, has successfully provided celebrity inspired hair products to its customers. According to hair experts famous black female artists like Rihanna and Beyonce, serve as role models when it comes to hair fashion. Hair Stop and Shops sales executives though, believe that no other star but Nicki Minaj has generated so much demand for celebrity inspired wigs. Hair Stop and Shop deems that wig manufacturers are jumping in to capitalize on the trend. Wig maker Janet Collection, for example, offers the blunt cut bang short and medium bob styles, along with a curly afro style that Nicki Minaj sported on the stage at a Good Morning America show. 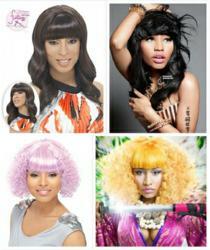 Harlem 125 and Isis Collection are two more hair manufacturers, that have replicated Nicki’s famous long wigs with full front bangs in bright and two-toned colors. By increasing its offering of Nicki Minaj wigs, Hair Stop and Shop sales force certainly hopes to please the rapper’s following. They also believe the bashing colors and unique styles that Nicki models, should appeal to their clients who love to make a statement. In addition to Nicki’s fans, Nicki Minaj look alike wanna bes, are expected to keep the demand steady as Halloween approaches. According to a survey, Nicki Minaj wigs are expected to be some of the most sought wigs in Halloween costume stores this season. The artist herself, explains her adoration for her hair wigs in an interview for Hype Hair magazine saying: “Go for a human hair wig in jet black with a blunt cut China bag...I like the green bob. Everyone seems to like that. People are saying it's the winner right now...I decided to choose a new look. Color makes me happy. It really excites me. I am a very visual person and when I look in the mirror, and I see green or I see pink, it does something to my attitude. It makes me feel positive."